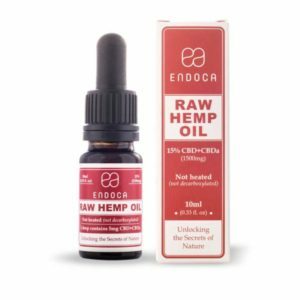 Endoca CBD Hemp oil drops are a very concentrated Hemp extraction using the gentlest CO2 method. Raw means that no heat has been applied to the Hemp during any of the extraction or filtration processes. Similar to juicing the plant. This process gives a wax-free liquid and maintains all of the main botanical constituents. Their proprietary formula contains the full spectrum of cannabinoids, terpenes, and flavonoids along with omegas, vitamins, and minerals that are sometimes missing from our diets. Endoca’s Hemp extracts are produced under pharmaceutical control using constant innovation in their methods. The formulations used come from a team of scientists, herbalists and nutritionists. This along with rigorous lab testing insures that the products are natural, organic and carry consistent purity in every bottle. The Raw Hemp Oil drops are available in a 3% concentration for 300mg CBD-CBDa per bottle and a 15% concentration for 1500mg CBD-CBDa per 10ml bottle .